The older I get the more I realize the importance of good skin care. Good skin care also doesn’t mean that it needs to cost a lot. I think it’s all about finding products that work with your particular skin type and lifestyle. For me, that means calming products that help my redness, hydration for my dry skin, and products that are minimal and easy to apply. An added benefit is when the products are animal friendly and include a lot of natural ingredients. 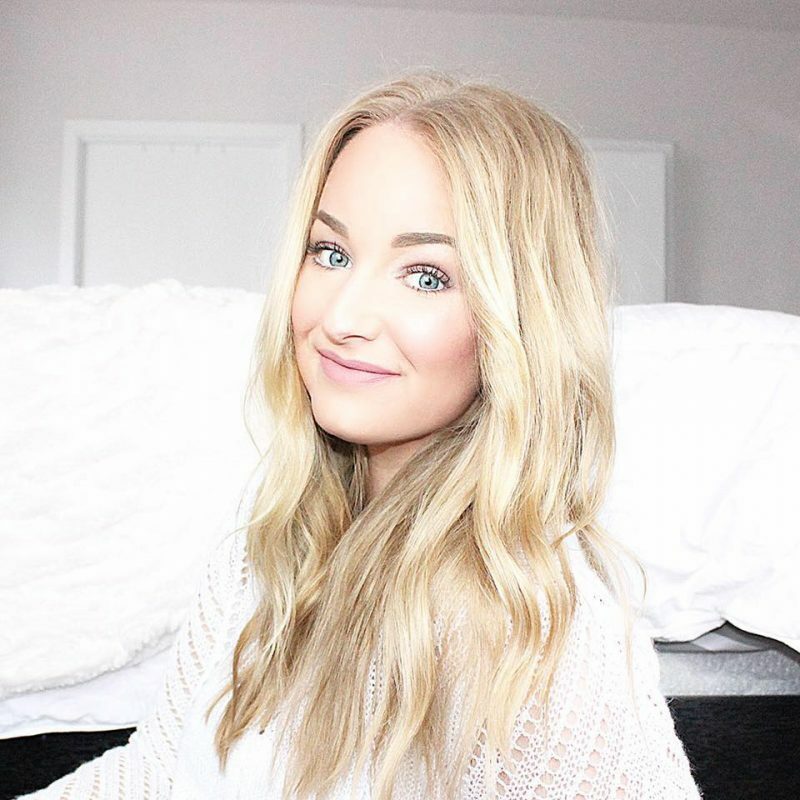 Lately I’ve been super into testing out new formulas to find what works best for my skin at the moment. 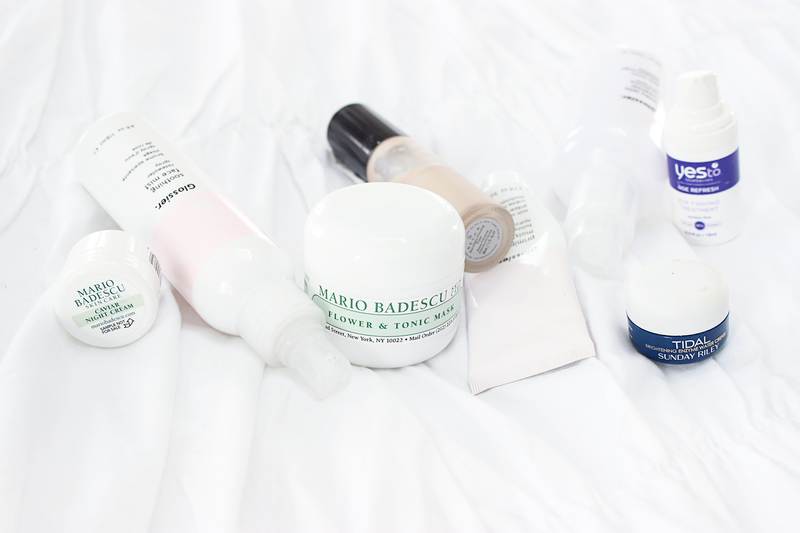 I’ve also found myself narrowing down my products to a few favorites that I use for both day and night. 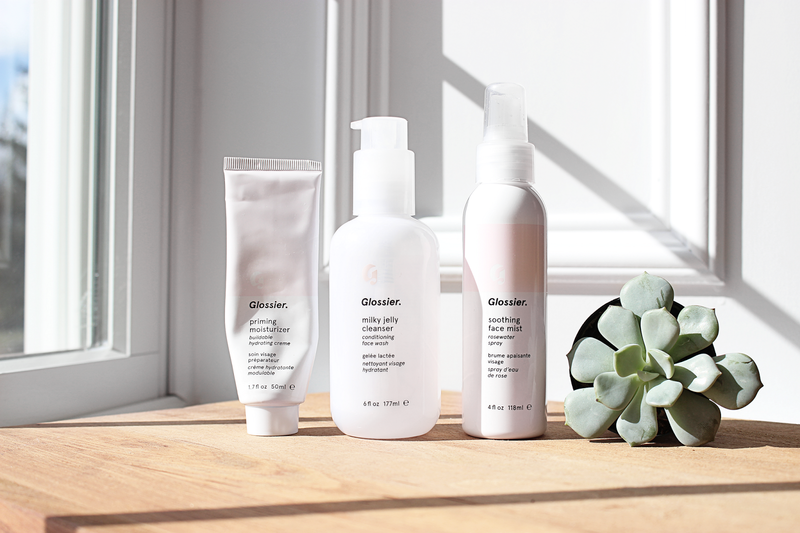 The first step in my skincare is always to wash with Glossier’s Milky Jelly Cleanser. I’ve used this product for a few years now and always re-purchase when I see that I’m running low. I find this cleanser to be the only one that cleans my face without leaving it feeling dry and tight. It’s super gentle and just feels good when you use it. If I have a face full of makeup then I’ll normally use a face wipe (Burts Bees and Yes To! make my favorites) to take majority of it off. I’ll then follow with a pump and a half of the Milky Jelly and massage it into my dry skin. This way the product gets a chance to cleanse and treat your skin, not the layer of makeup on top of it. I then wet my hands and work the product into a lather – although it doesn’t sud up. Instead it breaks down into fluid and really begins to take off the makeup. To finish it off I splash water on my face and pat dry. It seems simple, but the combo of the washing process with the cleanser really leaves my skin feeling so soft and clean. For the day: I apply a light layer of the Glossier Priming Moisturizer. I then follow with a light layer of the Becca Backlight Priming Filter – patting both products into my skin after the application. This combo leaves my skin looking like it has a healthy glow and creates a perfect base for my foundation. For the night: I tend to go for heavier products. 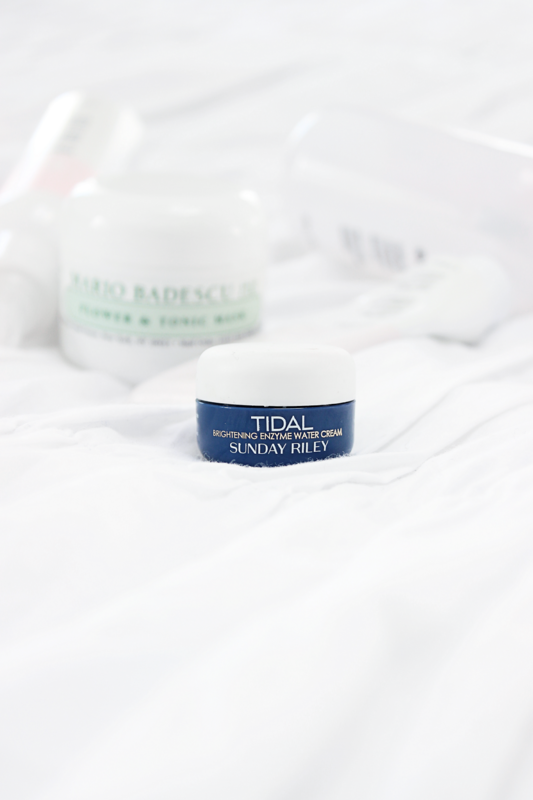 My favorite nighttime moisturizer lately has been the Sunday Riley Tidal cream. It weirdly smells like kelp but is so lightweight yet hydrating. If I really need a good moisture boost then I’ll go for the Mario Badescu Caviar Night Cream. This stuff is super thick so I use it almost like a leave-on mask while I sleep. 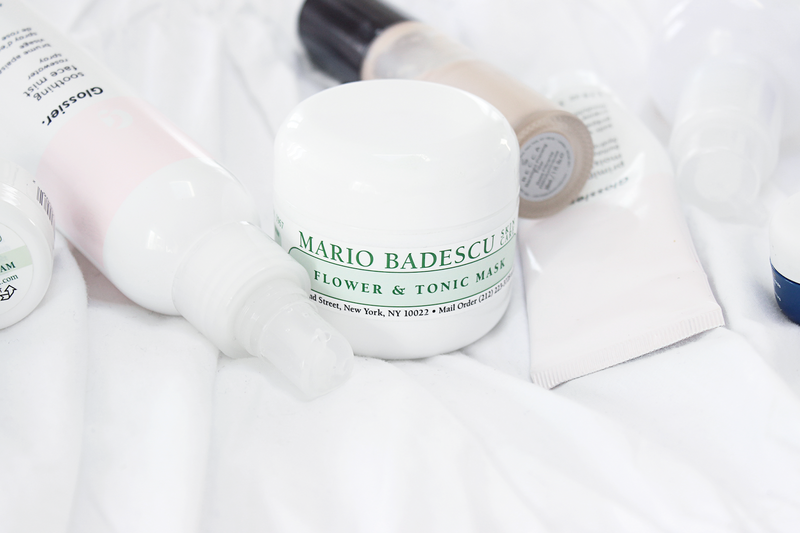 When it comes to face masks the Mario Badescu Flower & Tonic Mask is my absolute favorite. It smells beautiful and really balances my skin. I tend to use this mask when I’m breaking out or just need a deep treatment. Its texture goes on milky but dries down, leaving your skin feeling lifted and refreshed. I love using this at night but pull it out in the mornings when I want my makeup to look extra perfected. 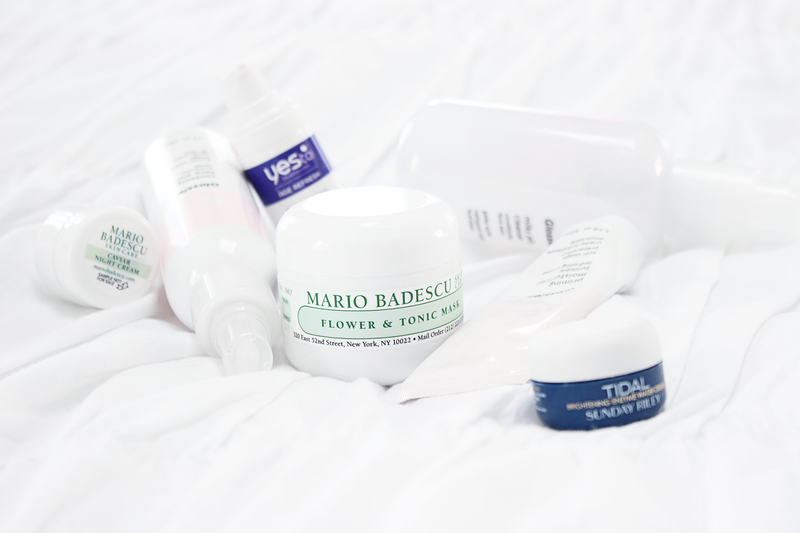 Have you tried any of my skincare favorites before? If not, which seems most up your alley?